The mission of Livingston County Public Library is to meet the recreational, educational and cultural needs of the community by providing equal access to information, ideas and knowledge through quality resource and services. 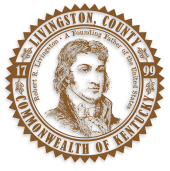 All residents of Livingston County and surrounding counties in Western Kentucky are eligible for a library card and are encouraged to become patrons of the public library. The first library card is free. At the time of renewal, subsequent cards are also free, but the patron's record must be completely cleared of all fines or the card will not be renewed until the fines have been paid. In case of a lost card, the cost is $2.00 each for replacement charges. The library discourages customers from allowing others to check out materials on his/her library card. Liability for misuse may be avoided by reporting lost or stolen cards immediately. Library cards must be presented each time a customer wishes to check out materials. Owning a library card makes the person or their guardian responsible for materials checked out on that card. Applicants under the age of 18 are required to have a parent or guardian give their consent on the application form. Signing the library cards means the customer agrees to assume responsibility for all who make use of the library card, pay all fines and/or other charges incurred, notify the library of any changes of address, inform the library is the card is lost or stolen, and comply with the Patron Code of Conduct. Applicants must be at least 5 years old to obtain a library card. Attention: The first two check-outs have additional limitations. Lost or Damaged Books: After 90 days, an overdue item will be considered lost. Patrons will be charged the purchase price of the item. Lost or Damaged Books on CD: After 90 days, an overdue item will be considered lost. Patrons will be charged the purchase price of the item. Lost or Damaged DVDs: After 90 days, an overdue item will be considered lost. Patrons will be charged the purchase price of the item. Library fines must be paid to check out new materials. 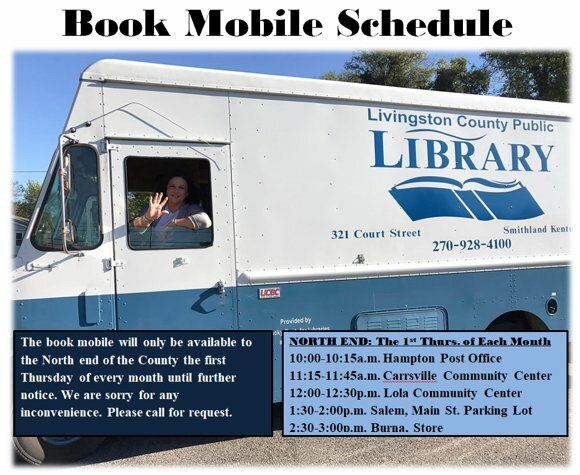 All persons have free access to the Livingston County Public Library during the hours it is open and the right to the reasonable use of its facilities and services. It is the policy of the library to maintain a safe facility, free from any threat of physical violence, emotional abuse, or any form of intimidation. All patrons are required to comply with these rules and regulations. Patrons must show respect for other library users and staff at all times. Loud, unreasonable, and/or disturbing noises created by persons, electronic devices, or cell phones are prohibited. Cell phones may be used outside the library facility. Sleeping or putting one's head, feet, or legs on the furniture is prohibited. Moving furniture without library approval is prohibited. Consumption of food and/or beverages is prohibited in the main area of the library. Smoking or other uses of any type of tobacco is prohibited. Possessing or consuming alcohol or illegal drugs or being under the influence of alcohol or illegal drugs at any time is prohibited. Shoes and shirts are required at all times while using the library. No animals are permitted, except those assisting patrons with disabilities. Selling and/or soliciting for services, money, or items is not permitted. No weapons of any type are permitted in the library. Any behavior that is disruptive to other library patrons is prohibited, including vulgar gestures. No one shall engage in disorderly conduct, fighting or challenging another to fight or use obscene/offensive words that might provoke violence from another patron. No one shall intentionally damage, destroy, or remove any library property, or another patron's property from the premises. No one shall congregate around entrances and/or exits to the library. The children's area of the library is for the exclusive use of parents/guardians and their children or adults. All children under 10 years of age shall be in the care of and attended by a responsible person over 18 years of age. No one shall leave a child or young adult (up to 18) at the library after closing hours. Individuals who fail to adhere to the library's guidelines may be asked to leave the library. The library may take appropriate legal measures to enforce appropriate behavior to prevent access to individuals who refuse to comply. The Livingston County Public Library is proud to offer free Internet access to enhance information available to the public. Children under the age of 10 must have a parent or legal guardian in attendance with them at all times to use the computer for Internet use. To use the computers, patrons must have a library card. Library computer users must have an account in good standing. All fines must be paid and overdue materials returned. Patrons CANNOT use another person's library card to access the Internet computers and can result in loss of computer privileges. Because of limited workstation space, only 1 person per computer is allowed. Patrons must be considerate of others and keep computer volume low or use headphones. Computer access is available on a first-come, first served basis with a 3 hour limit (in 1 1/2 hour increments) each day for each patron. If there are no computers available, the patron will be asked to put his/her name on a computer waiting list. Patrons will be allowed to print 10 pages free per day. All proceeds go to the Friends.